I am very pleased to say that we have had some considerable success in clarifying the rights of photographers to take pictures in public places and on private land. 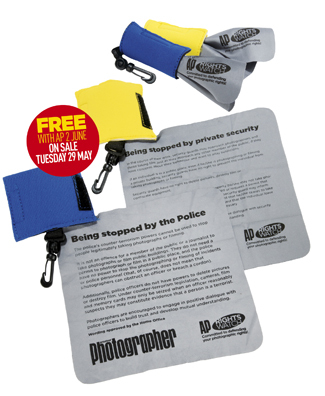 You may remember that in July 2010, Amateur Photographer gave away a lens cloth that quoted the words of the head of the Specialist Operations for the Metropolitan Police Service. This was intended as a guide for our readers as well as something to show an inquisitive police officer in the event that the law was being misused. I understand many of you found it very useful. Earlier this year we were able to go a step further and obtain new and clearer wording after extensive consultation with the Home Office. While our first cloth had guidance that appeared to apply only to the London area, there can be no doubt the Home Office covers the whole country. As well as clarifying the position with the law and police powers, we have been able to establish a form of words as guidance when a photographer is stopped by a private security officer. Private security firms are not governed by any unified code of practice, but their powers over members of the public are restricted by the law. In fact, a private security guard has no more power than a private individual, which may surprise many of them, and our cloth makes it clear what they can and cannot ask you to do. On each magazine dated 2 June, on sale from 29 May 2012, we will give away one of these cloths. The cloth relevant to dealing with the police has a blue wrap, and that for private security has a yellow wrap. I suggest you try to find one of each. Should you be lucky enough not to ever be approached by a police officer or a security guard, you will at least have a very handy lens cloth. And, what’s more, a neutral grey surface from which to establish a custom white balance or to give you an idea of exposure.